Modern seafront holiday home in Rosolina Mare, close to Venice. This property is composed of different seafront apartments, all equipped with elevator. 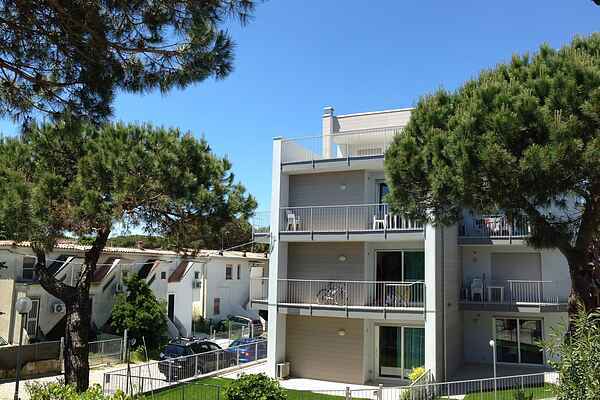 Ideal position only 100 metres from the beach and 500 metres from the city centre. The accommodation is well equipped with a satellite TV, mosquito nets, washing machine, air conditioning, microwave, free Wi-Fi, 2 balconies or private garden, one parking spot or garage. The city tax is 1,43€ per person, per night, for a maximum amount of 10€ per apartment, per week. This is valid from June 1st to September 30th. Rosolina Mare offers different attractions and facilities to tourists : a beach, a pine grove, a playground, a botanical garden, Parco del Delta del Po, restaurants, shops and much more to make your holiday a pleasant one. The position is ideal to explore Venice and the rest of the Veneto region. Rosolina Mare is the pearl of the Po Delta Park, a peninsula surrounded by water about 8 km long valley and the Adriatic Sea, mainly covered by dense and lush pine forest. The water of the sea for long and pleasant bathrooms and the beach, famous for its breadth, is a vast expanse of fine golden sand, extremely clean. The sea of Lido di Rosolina is renowned for its quality. Environmental values are constantly monitored by the competent public authorities, while the Rosolina Sea ecosystem has often been rewarded by the organizations and environmental groups, earning it the prize of "Dolphin Blue" (ARPAV), the "Two Sails" (Legambiente) and the quote on the "Blue Guide" (Italian Touring Club). Coastal Botanical Gardens of the Veneto aims to protect and conserve the natural environment and unique, of great scientific interest. The garden is visited annually by more than 10,000 people, following some 4 km of trails, have the opportunity to know the sequence of vegetation and the species, which are all idenfiticabili by affixing the labels. Delta Po Park: The fairy to go slowly, exposing the pervasive gentleness of the landscape, taking ownership of the silence of nature, enjoying the mysterious web of canals and reeds, enjoying the magnificent sunsets of bullies etsate, diaphanous winter. Seductive like few other places in the world, this is the Delta del Po: a natural paradise between earth, sky and sea, where the uncertain gait of the land sought refuge in a sea that seems to have no end. Places for children: the main theme of the holiday is to know the natural environments (water, earth, sky) through the conduct of excursions and sport activities such as canoeing, archery, swimming pool .... During their stay, the kids can go to the beach to swim, walking and many entertainment activities. The beach is equipped with large areas of shadow assistance of the lifeguard Many activities in Rosolina Sea are dedicated to sports that enable students to know and appreciate better the nature of the park, along the footpath through the pine forest nearby.